When exploration of crude oil, coal mining occurs and burning of fossil fuels there is an increase in atmospheric carbon which is higher than natural sedimentation of Carbon as observed in industrialized nations. In the last two and a half centuries, the concentration of CO2 in the atmosphere has increased by one third. 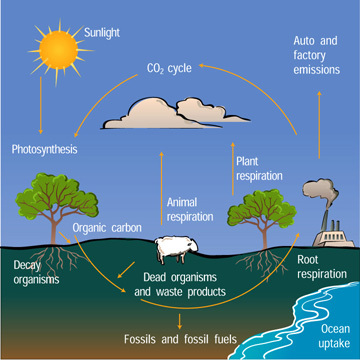 Ecosystems which were a net source of CO2 during the 19th and 20th centuries have become a net carbon sink as observed recently. The total amount of nitrogen made available to organisms by human activities has greatly increased, especially since 1950 because of the use of synthetic fertilizers. Human activities are now responsible for most nitrogen made available than all natural sources combined. For there to be a perfect system a balance between CO2 intake by plants and O2 must be at equilibrium suitable to maintain a stable system which is never the case. Fossil fuel combustion and all other industrial actions releases about 7 billion tons of Carbon which is higher than carbon released by vegetation, also nitrogen released has had a sharp rise beginning in the 1990’s due to man’s effect. 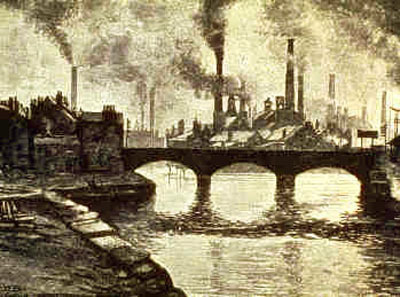 The industrialization drive of these cities round the world often affects the environment and natural ecosystems, for example during deforestation there is a transfer of carbon from biomass into the atmosphere, with immediate impacts being reduction in biodiversity and an increase in global warming. Atmospheric carbon amounts are extremely higher than it where in the early sixties. As much as greenhouse gases are important for the planet too much of it would be detrimental and this is exactly what industrialization and urbanization causes and this human induced carbon cycle usually has a more rapid damaging effect than a naturally occurring carbon cycle. With a non ending increase of global warming and greenhouse gases emissions caused by this day to day growth in industrialization the negative impacts according to studies are numerous; extinction of plant and animal species, particularly food production, Timber and fisheries are important for employment and economic activity but upon industrialization a lot of these are lost, but excessive and unsustainable use can lead to losses in the long term. A country could cut its forests and deplete its aquatic life, and this would show only as a positive gain to the economy but a huge loss of capital assets. If the full economic importance of ecosystems were taken into consideration in decision-making, their degradation could be significantly reduced or totally reversed. In my home country of Nigeria, poverty is the main gain of industrialization because a lot of this people survive on their immediate ecosystem for food and sales of food and livestock as well as grazing and hunting. In summary, industrialization has done more harm than good to carbon balance. It has significantly altered ecosystems and sometime made such ecosystem slow or impossible to recover from the damage. This is the sad part of Industrialization we have to live with.